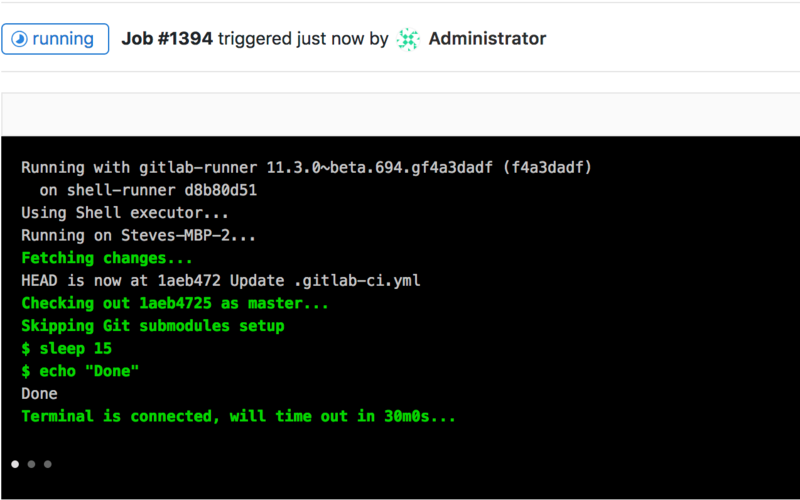 Interactive web terminals give the user access to a terminal in GitLab for running one-off commands for their CI pipeline. Since this is giving the user shell access to the environment where GitLab Runner is deployed, some security precautions were taken to protect the users. NOTE: Note: Shared runners on GitLab.com do not provide an interactive web terminal. Follow this issue for progress on adding support. For groups and projects hosted on GitLab.com, interactive web terminals are available when using your own group or project runner. NOTE: Note: Not all executors are supported. NOTE: Note: The docker executor does not keep running after the build script is finished. At that point, the terminal will automatically disconnect and will not wait for the user to finish. Please follow this issue for updates on improving this behavior. Sometimes, when a job is running, things don't go as you would expect, and it would be helpful if one can have a shell to aid debugging. When a job is running, on the right panel you can see a button debug that will open the terminal for the current job. When clicked, a new tab will open to the terminal page where you can access the terminal and type commands like a normal shell. Read the Web IDE docs to learn how to run Interactive Terminals through the Web IDE.